Image caption Kai Tap told the BBC: "We used to run into the swamp and hide there with only our heads above the water"
Eleven-year-old Kai Tap sits alone looking pensive as he watches other children sing and play at Eden school inside a civilian protection site run by the United Nations in South Sudan. He recently arrived at the camp in the northern town of Bentiu having walked 129km (80 miles) alone for four days and nights from Leer, a small town in Unity State, scene of the most recent fighting in the country. "At night they would come and start shooting at us and we would disperse," says Kai. "We used to run into the swamp and hide there with only our heads above the water." He cannot remember how many days he spent hiding in the swamps. 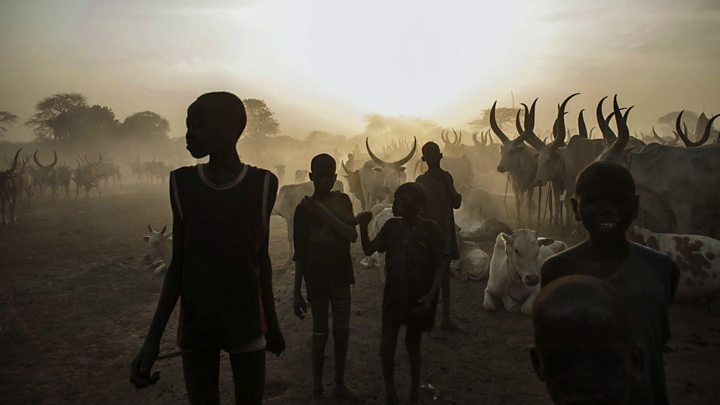 Media captionSouth Sudan is the world's youngest country and much of the region's recent history has been characterised by violence. "I don't know if they are safe, if they are alive or dead because there is ongoing fighting. And now I'm torn between two things - to go to school or to return home to bring my parents." Former Botswana President Festus Mogae, who chairs a commission that monitors the 2015 peace agreement, says the ongoing hostility might trigger an "uncontrolled escalation of violence". As a consequence of the deteriorating security situation, transporting goods by road is severely hampered. Image caption Hundreds of civilians have sought refuge in "protection sites"
The UN children's agency Unicef says the escalating crisis means that they have to increase supplies, staff and security officers. "Malnutrition in Northern Bahr al-Ghazal has gone up threefold and so we have to have three times the amount of supplies to respond to the children's needs," says Mahimbo Mdoe, Unicef's representative in South Sudan. The situation, he says, is "dire" with up to six million children affected. South Sudan's government has agreed to the deployment but with conditions. President Salva Kiir's spokesman Ateny Wek Ateny said that the government would determine "where the troops come from and where the protection force would be based". Deputy chairperson Lt Gen Augostino Njoroge said the JMEC has been advised by the regional heads of state to continue working with the government of South Sudan, including newly appointed Vice-President Taban Deng as the representative of Mr Machar's side. "Whatever differences there are within their side, they will be able to solve them and we should not stop implementing the agreement because it has much more," said Gen Njoroge.